Roundabouts, golf carts and even boat docks are some of the subtleties associated with the North Augusta Ballpark Village, previously code named Project Jackson. The potential amenities were part of a video presentation of the mixed-use development unveiled to the media last week. 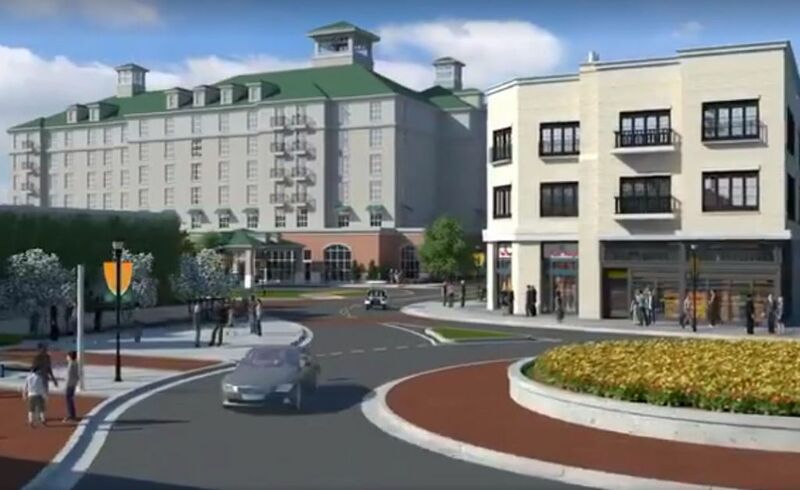 Although exact details are still being ironed out, North Augusta officials and private developers said the video is an accurate representation of what the more than 35-acre development will look like. “It’s going to be a terrific environment,” said Chris Schoen with Greenstone Properties, and also a partner in the Augusta GreenJackets, which plans to move to the North Augusta development by 2018. The nearly three-minute video whisks viewers above and through the streets of the development, which in addition to a new minor league baseball stadium, will include 70,000 square feet of retail space, a new hotel, a conference center and other amenities. North Augusta City Administrator Todd Glover said the City is in talks with a hotel operator. The name of the hotelier will be announced sometime after third reading of the master development agreement, which could come as soon as November. The hotel will be situated across the street from the baseballs stadium, with upper floors overlooking the stadium from the first base/right field side of the stadium. Behind home plate is an office building with an apartment building and fitness complex located behind the left field fence. The stadium itself, titled GreenJackets Park in the video, is modeled after the San Francisco Giants’ home stadium. The GreenJackets are a Class A advance affiliate of the Giants. In right field, the stadium has a home run porch which ties into a restaurant that connects to a beer garden. Aside from baseball, the development will feature several restaurants, many of which have been identified pending final reading of the master development agreement. “We’ve increased the densities, but we’ve massaged it in such a manner that we have all the best aspects of a mixed-development,” Schoen said. Glover did say the City was in talks with Tupelo Honey, a Southern-cuisine restaurant chain based in Asheville, North Carolina, but Tupelo Honey opted not to add a Project Jackson location. Several new roads, some connected via roundabouts, will be paved within the development. There also will be parallel parking along Railroad Avenue. North Augusta officials and private developers confirmed parking will be metered. Project Jackson also includes a parking deck which will consist of paid parking as well, according to Council documents. Another unique feature to Project Jackson is that there will be limited accessibility by boat via the Savannah River. Glover said the City received a grant for an eight-slip boat dock. The dock, according to the video, will be near a large riverside amphitheater suitable for small concerts and live entertainment. Also shown on the video are golf carts meandering through the development. Schoen said the intention is for there to be golf cart traffic, pending City Council approval. Pending third reading, some elements of Project Jackson are expected to break ground as early as January 2017, according to Council documents.